Our photo of the week was taken by Jacob Charles! 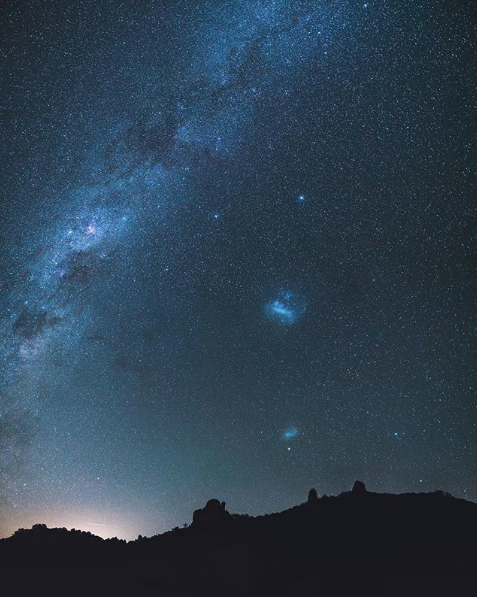 Here is what Jacob said on his Instagram page about this photo: "Took a trip out to Nimbin (in New South Wales) to get some Milky Way photos of the Nimbin Rocks and got a pretty clear view of the Magellanic clouds." Be sure to check out more of Jacob's work on his Instagram page. You can also check out his work on Tumbler. Our beautiful world is full of amazing landscapes, from rolling meadows, large mountains, deep valleys and majestic oceans. But if photographed right, the starry sky can also be an amazing thing to photograph. We found some amazing photography of the nighttime sky and stars that are taken over Washington State. These images were captured for the 8th Astrofest Astrophotography Exhibition showcase and the photos are quite stunning. “Curator Dr John Goldsmith said, “We have some lovely entries featuring the supermoon; we have a lot of images of deep space objects done by people using good telescopes. 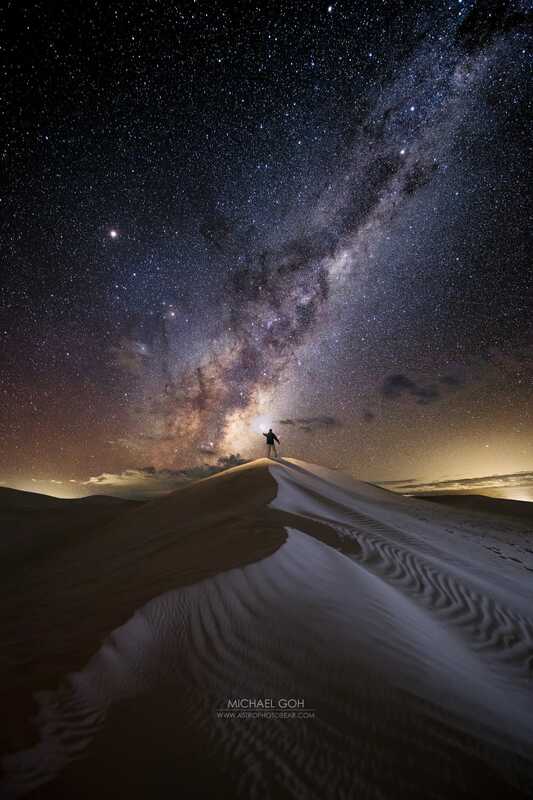 Check out these awesome photos of the nighttime sky below that we found on The West Australian! Did you take a photo outside at a festival, street fair or sporting event and really want to add a little something extra to it? Overlays Made Easy! The Collection would be perfect for you! This product will help you to fix a blown out sky and edit in a "mood." It even includes bokeh overlays to really add some pizazz to your backdrops. Get this collection today for $99.99! Whether you prefer to take nighttime photos in the countryside with beautiful lands as far as the eye can see or in a city that comes alive with the lights of buildings and traffic illuminating the sky, night photography is an exciting aspect of picture taking to explore. Taking photos at night does require a bit more preparation and thought than other shots. Check out this video with tips from Jeff Cable, a three time Olympic Photographer who also has a passion for shooting at night. Watch his class from B&H Photo for an overview of the basics of night photography and specific tips for different locations. Enjoy! The night sky is truly a beautiful thing, but in many places around the world, light pollution can affect the way we actual see it. It is truly sad that many of us do not get to see a beautiful night sky like the one below in the photo. To be able to look up and see all the millions of the stars overhead and the milky way, shows how unique and beautiful our world is. To see the extreme difference of seeing a night sky without light pollution like in the photo above and seeing one with it is so different. Photographer Sriram Murali created a video that will help show the difference in his new time-lapse project. The work is titled “Lost in Light,” and it shows different locations with progressively lower levels of light pollution. The project follows the Bortle scale of light pollution, which measures the brightness of the night sky. Class 8 and 9 are given to very bright city skies and inner-city skies, and Class 1 designates the darkest skies on Earth. This time-lapse was shot mostly in California and you will see how the view gets better as you move further away from the lights. We hope you enjoy his film below. If you love photographing anything outdoors, this set of photoshop and photoshop elements actions will enhance your backlit photos and turn them into works of art. The Creative Backlit Golden Hour Actions comes with 10 actions that will all give bold and dreamy effects. GET YOUR CREATIVE BACKLIT GOLDEN HOUR ACTIONS NOW! When you're a budding photographer, you find yourself fervent with passion and eager to plunge into a variety of different situations with your camera in hand. Photography has so many subcategories to choose from; landscape, portrait, underwater, candid, and of course, night. Whether you dwell in the countryside with sprawling acres of land you wish to capture beneath a dark, starlit sky or in a city that comes alive with the lights of neon signs and streams of traffic, night photography is an exciting aspect of picture taking to explore. It does, however, require a bit more preparation and thought than other shots. Read on for an overview of the basics of night photography that always apply, as well as specific tips for different locations, be it an empty field in Vermont or the streets of New York City. Photography is always about the same thing regardless of the time of day or location: capturing light. The challenge with night photography arises due to the fact that there obviously isn't much light to work with. The great thing about taking pictures after hours is that you can learn a great deal about the true extent to which proper lighting and camera settings will alter your shots. Whether you have a point-and-shoot or SLR, there are four main points you should always consider before you head out to start your nighttime shoot. Flash: Does your camera have an on-board flash and is there the possibility to add on another? Shutter and Aperture Control: What settings does your camera have in regards to the adjustment of shutter speeds and aperture settings? If there aren't any, check if there is at least a "nighttime" preset that will adjust the settings accordingly. Film speed: Can you adjust the film speed (ISO) manually or are there pre-configured settings? Shutter release: If you're taking self-portraits or need to adjust things in the shot quickly, it's important to know whether your camera has a self-timer option or can even be controlled by a remote. Night shoots for model photographers are dramatic, captivating and often times more edgier than anything they can envision in the day. However, photographing people is hard enough when you're in a fully lit studio, so going outdoors into a city where there may be an excess of distracting artificial light or in nature where there's barely a sliver can be challenging for a newcomer. If you're planning a serious shoot outdoors, the first thing you'll want to consider is lighting rental. It can be done for an affordable price if you contact smaller stores or even other photographers you know, and you'll also be able to receive some advice on exactly what type of lighting would be ideal for the shoot you have in mind. What you should do beforehand is visit the site and take some test shots; get to know your location, see exactly how much light is available, how your flash and settings effect your images and figure out exactly what you need to get to make the image in your head a reality. Preparation is key. When I shot the night shots for Brilliant’s custom Mercedes sprinter limo I had them drive me around to 10 different locations testing out light and backgrounds before we finally picked one then we finally did the final shot for. This was because lighting the inside of the van to be clear made the outside too dark and visa versa. It took allot of planning and tweaking to get both the inside of the van right and the skyline to look good as well. Film speed: Using a slower film speed helps you gain sharpness and visibility in your images. If you're capturing moving targets like cars or nighttime sports, then you'll want to keep the ISO at a fairly normal or even higher than usual level. Aperture: This controls how much depth will be in focus, so the settings will change based on what you're shooting. The larger the aperture, the lower the F-Stop number. You should test different settings on your own to get a feel for how the variations alter the image. Shutter speed: As with ISO, unless you're needing to freeze motion, then you should go with a slower shutter speed. Set your shutter speed for a proper exposure on your camera's meter if it has one, and remember to adjust the settings in the darkest parts of your setting to get the most accurate reading. Flash: Some novice photographers become a little too flash happy and think that it can be used on every single shot. Flash should be used to add additional light to a situation, not compensate for a total lack thereof. If you are in a black room and hope that a flash will illuminate both a model and the background behind them, you'll be sorely disappointed to find that everything is masked heavily in shadow. What you should do is use the flash at a relatively close distance (4 to 9 feet at most) and consider using it only when you really need to highlight a person or object. Night sky photography or time-lapse photography will require a tripod, patience and some research beforehand. This article goes into depth about the logistics of capturing stair trails and time lapses. What you should remember is that since you'll want a space with as little noise - visual, not audible - as possible and to increase the exposure as the subject - in this case, the actual black sky - isn't able to be any further illuminated by artificial means. Nighttime architecture has its advantages in the city as there is often a lot of light from cars and buildings. The most important thing to remember here is your focal point and exposure. You want to use shadows to your advantage as a means to draw attention to the most interesting parts of the subject. Instead of trying to capture a whole building from 20 feet away, get close and center on the parts of it that truly capture your eye and work on capturing those angles specifically. If you are going to start trying out nighttime photography or any photography remember that you will make mistakes and that is ok. In fact that is the only way you can really learn. I often refer back to this article about common mistakes to remind myself to remember and retain the lessons I have learned. Either way, night time photography simply looks “cooler” than daytime to me and it is al lot of fun.